***Stronger results quicker patient response, ***More complete recoveries in less time***More long-lasting results. A large number of these practitioners have given up their regular practices to concentrate on using the BodyTalk System exclusively. BodyTalk is truly bridging the gap between conventional medicine, alternative modalities and the energy medicine of the future. This occurs through complementing what already works and building new paradigms of health care at the same time.With the rapidly growing specialty fields of Sports Performance BodyTalk, PlantTalk, AnimalTalk, Family Matrix work and EarthTalk, the range of application for the BodyTalk professional is wide open and exciting! ONE Day ** FIVE Techniques ** Equals a LIFETIME of health tools for you, your family and community!! It is our hope that BodyTalk Access will be able to provide a basic level of health maintenance in communities and countries around the world where good health care may not be readily available. It is also our hope to reach families and give them options to take their health back into their own hands, literally. The BodyTalk Access program takes 5 of the techniques from the more advanced BodyTalk protocol chart. This program was designed as a community outreach. Designed for people of all ages. Successful in taking care of 60-70 % of average persons’ daily health challenges. A majority of your day-to-day health and stress-related concerns can be addressed easily with the BodyTalk Access routine, when done on a regular basis. Testimonials pouring in from around the globe due to the health challenge turn-a-rounds experienced with this revolutionary new program. The wellness routine presented in BodyTalk Access helps to re-establish internal lines of communication within the body/mind.This ultimately helps the individual have more resiliency towards stress and any other factors that can be detrimental to long term health. The Access routine is designed to be practiced as a complete set and can be done once a day or more depending on need. In this 6 hour certificate program you will learn powerful techniques that stimulate the bodies own ability to heal itself and takes only 10 minutes to do once learned! Cortices: is designed to improve and balance the communication between the two halves of the brain. Specific and immediate effects include improvements in thinking ability, memory, concentration, stress reduction, feelings of well being, and general physiological functioning of the body Switching: This technique can help restore normal brain function and helps with inattentiveness, poor decision-making, confusion, making silly mistakes, poor coordination, and mood swings. Hydration: this technique helps to correct the body’s ability to fully use the water it has available- thereby greatly improving the efficiency of all physiological processes. Reciprocals: The Reciprocals technique involves reestablishing the integrity of the structures of the body and can have a significant effect on many forms of injuries, arthritis, circulatory issues, coordination patterns, spinal problems, and chronic pain. Fast Aid Techniques: The BodyTalk Access System also includes an effective fast aid system that is non-invasive, safe and very simple. It will resolve simple issues as a stand-alone technique. In serious conditions it is designed to be used safely until specialized health care arrives. BodyTalk FUNDAMENTALS 1 & 2 (One course –two parts– 4 days) This course is suitable for health-care professionals who want to integrate it with their own specialty or use as a stand alone system. Lay people, as well that are looking for a new career will enjoy the BodyTalk system. 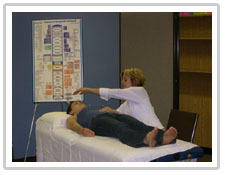 General treatments, including overall breathing patterns, left/right brain and body co-ordination, energy blockages associated with birthplace or imbalances with the local environment, energy faults within the main brain cortices, general and localized hydration, and health problems associated with internal and external scarring. Clearing the body of viruses, infections, parasites, food intolerance, environmental allergies and accumulated toxins. Treating the 36 surface energy points that often impact a person’s energy level, mood, overall structural integrity, muscle tension, and digestive system. Surface energy imbalances can also cause pain in specific parts of the body. Treating energy blockages associated with the nervous and circulatory systems. Balancing the various energy systems within the body including the traditional acupuncture meridians and the Chakras. Specific balancing of brain function and improvement of the circulation of nerves and blood to, or within, specific areas of the body. Correction of hereditary and/or environmentally influenced cell disorders. Repairing damage from vaccines. BodyTalk Module 1 is a pre-requisite for this course and this course is a pre-requisite for any of the advanced BodyTalk modules. Releasing emotions stored in connective tissue. The entire spectrum of energy medicine and the knowledge and integration of quantum mechanics, consciousness, and the new biology is about to expand geometrically. The BodyTalk System is perfectly situated to bring this exciting new wisdom into practical applications that work – balancing body, mind and spirit at the deepest levels. Certified BodyTalk Instructors are healthcare professionals that have been certified by the IBA (International BodyTalk Association) to teach BodyTalk or other related courses. This certification signifies that these persons have reached the highest level of qualification as BodyTalk instructors, have gained extensive knowledge and experience through the practice of BodyTalk and have met the IBA’s stringent quality standards.